What is a Week to Change Direction? GOOD Mental health is critical to everyone. Unfortunately, limited funding, resources and cultural barriers prevent people from receiving help when they need it. Through A Week to Change Direction and the support of this community, we are working to change that. A Week to Change Direction is a week of action, advocacy, culture change and fundraising for and by organizations, corporations, universities, communities and individuals. Our aim is to increase knowledge and support for efforts that are working to change the culture of mental health globally, so that all in need receive the care and support they deserve. A Week to Change Direction is happening anywhere and everywhere people and organizations want to Change Direction. Participants are empowered to become a part of the solution by taking actions that raise awareness in their communities. At the heart of A Week to Change Direction is our public health effort designed to teach everyone the Five Signs of Emotional Suffering that tell us someone is in emotional pain and may need our help. In order to ensure those in need get the care and support they deserve, we must make sure that everyone, everywhere knows the Five Signs of Emotional Suffering! If you recognize the Five Signs in someone you love, reach out, connect, inspire hope and offer to help. And if you recognize the Five Signs in yourself, reach out to someone you trust for help and support. Learn more about the Five Signs of Emotional Suffering here. We all have a critical role when it comes to changing the culture of mental health for everyone, everywhere. Below, you’ll find all the information you need to participate in an event, host your own event or generally help our communities raise awareness around key mental health topics. This toolkit is being updated regularly with new events and ways to get involved, so remember to check back often, and engage however you can! We invite you — nonprofits, companies, government agencies, universities, schools and individuals — to engage in activities that can help change perceptions around mental health and best reflect your unique strengths, skills and passions. Host an event. From hosting a fun run with a mental health theme, to partnering with a local school for a discussion about the Five Signs of Emotional Suffering, to raising funds for a local mental health organization, there are so many ways, big and small, for you to take part in A Week to Change Direction. Click here for a list of events, and register your event here. Participate in an event. As communities convene for A Week to Change Direction, there’s no shortage of ways you can participate. Check out the events that you’re invited to participate in here. Spread the word. 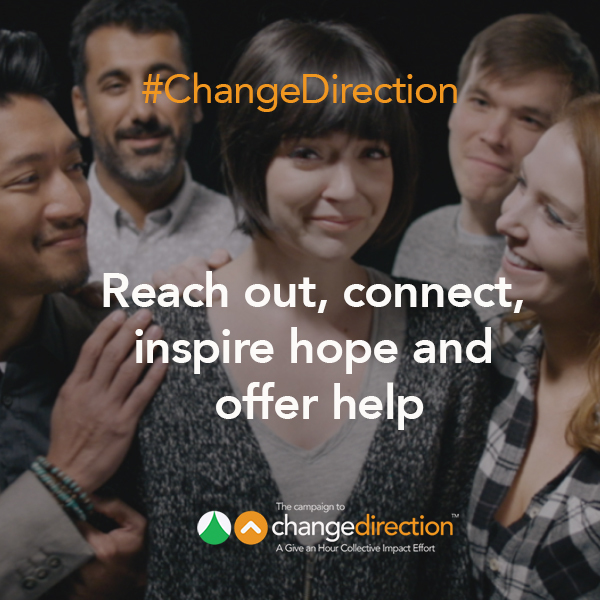 Make sure to use the hashtag #ChangeDirection in all social media posts to publicize your activities and contribute to the global conversation about mental health and the progress we’re making together during A Week to Change Direction. We also have sample social media posts, images and email templates below that you can use to spread the word and invite your networks to participate in A Week to Change Direction. Share a video on how you’re changing the culture of mental health. How are you changing the culture of mental health? Share a 30-second video on social media to let the world know! Make sure to tag us and use the hashtag #ChangeDirection! A Week to Change Direction’s Mental Health IBM Innovation Jam will be a unique opportunity for everyone who joins A Week to Change Direction to participate in a global conversation focused on changing the culture of mental health. Through the IBM Innovation Jam collaborative social platform, participants in the Jam can contribute their innovative ideas, express their viewpoints, and share their personal stories. Based on these discussions, IBM Watson’s analytics capabilities will in turn generate actionable insights, recommendations, and findings that can inform our path forward in changing the culture of mental health. Whether you are an advocate, mental health professional, an HR professional, an individual with lived experiences with mental health or know someone with lived experience, we invite you to participate in the IBM Innovation Jam! Veterans, students, parents, artists, and those affiliated with multi-national companies, nonprofits, foundations, and many more — we want you to add your voice to the conversation. The Mental Health IBM Innovation Jam will take place Tuesday, June 11 through Thursday, June 13 of A Week to Change Direction. If you would like to participate in this crowdsourcing campaign, please click here to express your interest! Use #ChangeDirection to amplify the reach of your social media posts and to join the social media conversations. When you share content on Facebook, LinkedIn, Instagram and/or Twitter, download an image or video from this toolkit to add to your post — this will help attract greater engagement to your post! Social Sharing Video 6 - Add your voice! Share these posts with your professional network, friends and family through your own personal social media channels through June 9, 2019. We recommend personalizing these posts by adding a short message about why this is important to you. Don’t forget to tag anyone you think might be interested to make sure they see your post! A Week to Change Direction is June 9-15. Good mental health is critical to everyone, but limited funding, resources and cultural stereotypes prevent people from receiving help when they need it. We can change this! The world is coming together for a week of action, advocacy, culture change and fundraising for and by organizations, corporations, universities, communities and individuals. Emotional well-being is critical to everyone — but limited funding and barriers prevent people from receiving help when they need it. We can change this. From June 9 -15, the world is coming together for A Week to Change Direction — a week of action, advocacy, culture change and fundraising for and by organizations, corporations, universities, communities and individuals, led by [tag: @CampaigntoChangeDirection]. Want to let your colleagues and personal networks know about A Week to Change Direction? Copy and paste the email template below and fill in the blanks as needed! Are you ready to #ChangeDirection on mental health? The World Economic Forum estimates that mental illness will account for more than half of the economic burden of disease over the next two decades – more than cancer, diabetes and chronic respiratory diseases combined. In high-income countries, more than 35% of people with mental disorders receive no treatment. This rate can increase to 85% for those in low- and middle-income countries. Mental health affects [“me,” or “someone I love”] — and 1 in 4 people in our world. In many cases, due to limited funding, resources or stereotypes, people may not receive help when they most need it. We at [insert company name here] can change that. A Week to Change Direction is happening June 9-15 and is a week of action, advocacy, culture change and fundraising to raise awareness of and increase support for efforts that are working to change the culture of mental health globally. We encourage you and your loved ones to participate in this week with us. [Company Name] will be hosting [insert action here], and we want you to join us. We all have a critical role to play as we change mental health for everyone, everywhere. If you have any questions about this toolkit or the information in it, please reach out to us at changedirection@giveanhour.org. For more details about A Week to Change Direction, visit our website. The Campaign to Change Direction is a coalition of concerned citizens, nonprofit leaders and leaders from the private sector who have come together to change the culture about mental health, mental illness and wellness. The Campaign to Change Direction is a collective impact effort led by Give an Hour. Give an Hour’s mission is to develop national networks of volunteer professionals capable of responding to both acute and chronic conditions that arise within our society. Since 2005, we have focused on providing free and confidential mental health care to those who serve, our veterans and their families. We have since expanded our efforts to address the mental health needs of other populations. Through the generosity, compassion and expertise of Give an Hour’s skilled volunteers, we are able to increase the likelihood that those in need receive the support and care they deserve.